President Obama today sits down with Republican leaders after their big Election Day victories handed them control of the Senate and more seats in the House. 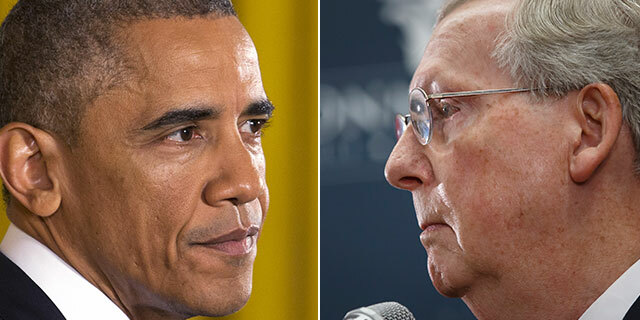 Both Obama and soon-to-be Senate Majority Leader Mitch McConnell expressed hope that the two parties would find a way to work together to get things done in Obama’s last two years. Both leaders mentioned international trade deals, tax reform and budget policy as areas of potential agreement, but there remain big gaps between both parties on key issues that are higher on the list of the public’s concerns. And in addition to the partisan divide, Republicans, in particular, face sharp differences in their own ranks on several issues. Obama repeated on Wednesday that he intended to move ahead with an executive order to make changes in the immigration system. Tuesday’s exit polls showed a huge gap between those voting Democratic and Republican on the question of whether unauthorized immigrants working in the U.S. should be deported or offered a chance for legal status. 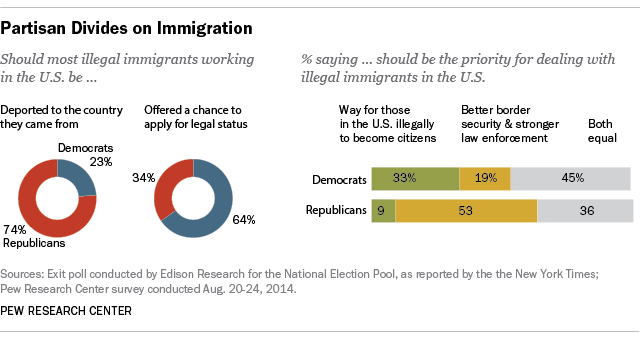 About three-quarters (74%) of those who said they should be deported voted Republican and 23% supported Democrats, while 64% of those who favored a chance for legal status supported Democrats and 34% voted Republican. The extent of this gap also emerged in a Pew Research Center poll conducted in August which found that more Republicans said the priority should be on better border security and stricter law enforcement than on an approach that also includes a path to citizenship for undocumented immigrants. By contrast, 45% of Democrats said both objectives should have equal priority and 33% wanted to put the focus on a path to citizenship. If the partisan divides were not enough, Republicans face deep divisions in their own ranks about the way forward on the issue — something that was starkly evident in the 2012 fight for the GOP presidential nomination when, with an eye on conservative activists most likely to vote, candidates battled over who was tougher on the issue. Pew Research’s Political Typology study, based on a survey conducted earlier this year, found evidence that this ideological divide within the GOP continues. Looming over all of this is Obama’s vow to enact immigration law changes by executive order if Congress will not act, something McConnell likened on Wednesday to “waving a red flag in front of a bull” as far as Republicans were concerned. A Washington Post/ABC News poll conducted in September found mixed support among the public about whether Obama should forge ahead: 52% said he should while 44% said he shouldn’t. After the election, McConnell and House Speaker John Boehner said the Republican agenda included “renewing our commitment to repeal Obamacare.” House Republicans have voted more than 50 times to do this. Even though Republicans now control the Senate as well, there’s little chance that they could produce a filibuster-proof vote to override an Obama veto. While the health law has resulted in millions of Americans getting coverage, the partisan divide on the issue persists: Tuesday’s exit polls found that 83% of those who believe the health care law went too far voted Republican and 14% voted for the Democrats. Only 19% of those who thought the law was about right voted Republican and 80% voted Democratic. Conversely, 78% of those who thought it didn’t go far enough sided with the Democrats and 19% voted Republican. 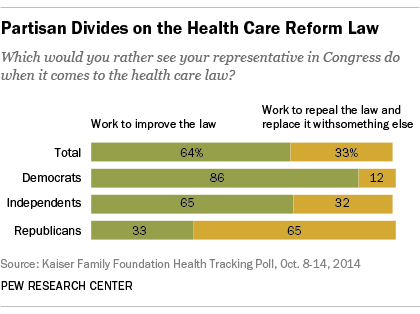 A Kaiser Health Tracking Poll conducted in October found that 65% of Republicans would rather see their representative work to repeal and replace it compared with 33% who favored keeping the law and working to improve it. By contrast, 86% of Democrats want to see their representative work to improve the law while just 12% favor scrapping it. In a Wall Street Journal column, McConnell and Boehner said their agenda would include passing a bill authorizing construction of the Keystone XL pipeline, a decision that Obama put off until after the election. A New York Times story described this as potentially “fertile ground” for Republicans to strike a deal with Democrats who have differed with the White House on the issue. Pew Research surveys have consistently shown strong public support for building the pipeline from Canada to the U.S. Gulf Coast, with 61% of Americans favoring it. 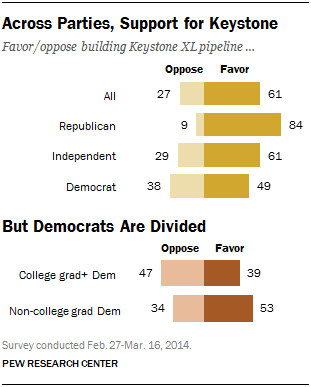 Fully 84% of Republicans want to see the pipeline built, but Democrats are more divided, with 49% in favor and 38% opposed. Although our polls have found broad public unhappiness with the tax system, tax reform has not ranked high on the list of the publics’ priorities in our surveys. Our last in-depth look at the subject, in a 2011 survey, found that while majorities of Republicans (60%) and Democrats (55%) agree there is so much wrong with the system that Congress should change it, they come at the issue with very different perspectives. 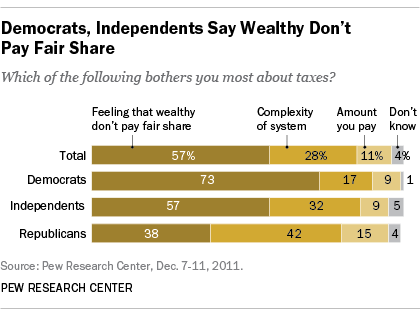 Democrats overwhelmingly (73%) point to the share wealthy people pay as the biggest concern, while many Republicans (42%) identify the complexity of the system as the biggest problem. Americans overall are lukewarm about the two major trade deals under negotiation – the Transatlantic Trade and Investment Partnership (TTIP), a free trade agreement between the European Union and the U.S., and the Trans-Pacific Partnership (TPP), a free trade deal between the U.S., Canada and 10 Asian-Pacific countries. About half (53%) of Americans see TTIP as a good thing and 55% say the same about TPP. 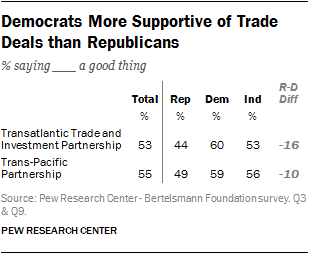 Democratic support for both treaties is stronger than that of Republicans: 60% of Democrats see TTIP as a good thing compared with 44% of Republicans, while 59% of Democrats look favorably on TPP compared with 49% of Republicans. While there may be the possibility of agreement here, the issue is not one of high importance to Americans who usually rank global trade near the bottom of the list in our annual January surveys of the public’s priorities. Any look at potential areas of agreement between the parties as well as their ability to overcome areas of strong disagreement has to start with a consideration of how bitterly partisan the political environment has been for a while now. A key finding from our survey this year on polarization was how much the antipathy between the parties had deepened and become more extensive. More than one-third (36%) of Republicans saw the Democrats not only as opponents, but as a threat to the nation’s well-being, and 27% of Democrats said the same of the GOP. Those kinds of sentiments were reflected in the exit polls on Tuesday, which found 93% of those who described themselves as feeling “angry” about the Obama administration were Republican supporters and 84% of those “angry” at Republican congressional leaders sided with the Democrats.